Marshall Electronics Broadcast division description and specifications for PS-102-HDI Server with 2.0 MP high definition encoder and Producer Station with HDMI that allows real-time transmission of an SD/HD-SDI, HDMI, or NTSC/PAL composite video signal along with bi-directional AAC encoded high definition stereo audio over standard IP networks. Connect your Producer Station to Internet and Video and Audio to Producer Station and start streaming LIVE. The Producer Station is a self contained appliance that accepts the audio & video feeds of the event to broadcast and processes the feed to IP for transport to the StreamVu TV server via a high speed broadband / Internet connection. The Producer Station contains all hardware, software, audio & video processing and encoding needed for live streaming. Each event is scheduled and setup by the Producer via the Producer Portal prior to arriving at the event location. The Producer Station receives its command & control information via the Internet upon connection at the event location. The Producer Station automatically locates the StreamVu TV sever upon connection to the Internet and power-up, performs a series of discovery tests & analyses, establishes the communication link to the server, and readies the initiation of the broadcast. A simple click of a mouse via the Producer Portal is all that is needed to enable the beginning of the broadcast. Likewise, a simple click of a mouse via the Producer Portal is all that is needed to terminate the broadcast. This process is typically performed after-hours and can be accomplished over any Internet connection at any speed. 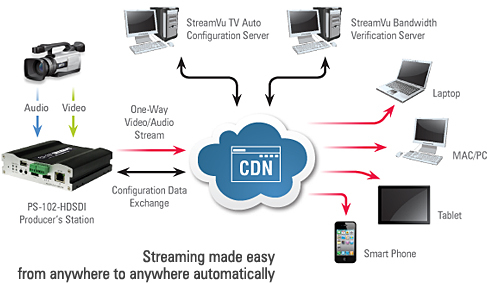 Upon connection to the Internet, the Producer Station will locate the StreamVu TV server, establish the link, exchange pertinent data with the server, and the server will retrieve the event file. The event will be placed in the appropriate sections of the Producer's on-line inventory of events and will be available via the Viewer portal for view and downloads as permissioned by the Producer. Upon successful transmission of the event file to the StreamVu TV server, the system performs house cleaning on the Producer Station and readies it for its next event to broadcast.